Formerly the 1-AA Conference, the Football Championship Subdivision (FCS) provides a playoff format for the best team to prove itself. The best players in the FCS, however, have to prove themselves in different ways. 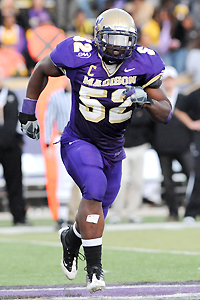 Arthur Moats led James Madison in tackles (90) and tackles for loss (23.5) on his way to earning the Buck Buchanan Award for the best defensive player in the FCS. He further proved his ability at the NFL combine, where the 6-foot, 245-pound former end ran a 4.64-second 40 and bench-pressed 225 pounds 24 times. In an open discussion with PD, Moats touched on getting his name out there, rushing the quarterback, and meetings with pro teams (including one our readers will find interesting). Well, let’s find out where you are and what you’re up to these days. Okay. Well, right now I’m in the airport. I just got done with my visit to Buffalo. That went real well: I talked with the coaches, and I definitely feel like I fit in perfectly with their schemes and everything like that. I’m currently on the way to Philadelphia to visit with the Eagles now, so we’ll see how that turns out. So, are these teams talking to you about making the switch to outside linebacker? How’s that going? Well, with the Bills, they want me to play inside. With Philly, they want me to play outside. I just feel like it’s a match-up with all the teams, you know. Some of them want me at inside linebacker, some want me outside. But I’m feeling more like, I’m willing to learn. Whichever you want me to be at, I feel I’m going to be productive. Definitely on special teams, and then eventually I’ll come around with (learning) the linebacker stuff. What other teams have you met with? I’ve had personal workouts with the Patriots, Bengals, Jaguars, not including my pro day or combine. And as far as visits go, I worked with Buffalo (Monday). Going out to Philly (Tuesday), and then next Tuesday I’m going to San Francisco. Well, of course I’m interested in how the workout with the Patriots went. How’d that go? Oh, it went real well, real well. They worked me out at outside and inside linebacker, and I also did some pass-rush drills for them. I did feel that it was very productive, and I thought I showed a good amount of stuff, a good amount of range. Now, you don’t have to get into specifics if you don’t want to, but was there anything about that workout that was different from other teams…? Yeah, the one thing that stood out with the Patriots was definitely the mental aspect of it. We definitely spent a long time in the film room, you know, just watching my film, and then talking about schemes and everything like that, as far as learning the coverages and seeing if you were going to be smart enough. Whereas with the other workouts, it was just, they’re going to see how athletic you are. It was definitely a big deal. So, when they’re watching your film, they’re looking at you from a defensive end spot. Are you projecting to other positions as the play goes on? Yes, sir, definitely. Yes, I feel that way. As you watch, are you explaining what you’d be doing from a different spot on the field? What do you think are the most significant differences between a 3-4 and a 4-2? Oh, I think there’s a lot, in that, basically… in a 4-2, you know you’re going to have a six (gap DE), a three, a one, (D-tackles) and a five (gap DE), whereas with the 3-4 you have those three big linemen, but you have four backers. You’ve got one that’s going to be rushing all the time, one that’s not. You have more flexibility with it, I feel. And what do you think was your strongest asset as a lineman? Definitely rushing the passer. I felt like (with) my speed off the edge, I had a lot of (offensive) tackles that missed, actually, you know? I was surprised to see that, on your player page, you were 6-2, and at the combine you ended up being six feet. (Laughs.) How did that happen? I don’t know. I’m not usually – I wasn’t even concerned with the height. In other words, you know, I knew that I ran fast, plus I did all my agility drills real well. And I definitely looked at the position. That’s what I focused on. I feel like with the height, I mean, whoever’s back there measuring, one could say six and a quarter, one could say 6-1, one could say six-foot. But I’m not really concerned with that height. Well, it’s almost more impressive that, as a six-foot defensive end, you got the Buck Buchanan Award. (Laughs.) So, what was it like to go against guys who were not just 50 pounds heavier, but four or five inches taller every week? Oh, I never really looked at them as being that (much) bigger. I just knew what I could do to expose their weaknesses, and I always felt that my speed and my power would overcompensate for their height and everything like that. You know, I wasn’t really worried about that. I always felt that it looks better on film, to see a little guy out there doing his thing. Who were some of the best players you went against this year? Definitely the tackle from UMass, Vladimir Ducasse. The tackle from Villanova, I think his name is Ben Ijalana. The guy from Maryland, Bruce Campbell, he was injured when we played them. But I feel like those are the two main guys that really stuck out to me this year. Besides speed rushing, do you feel like you have other moves? Oh yeah, definitely. Definitely. The speed rush is my base, go-to move, but I have a bull rush. I have multiple rushes: I’m spinning inside, I’m spinning outside. I use what’s called a skate rush, which is a combination of speed and a bull where you use the guy’s momentum against him. I mean, I have a lot of moves. You’ve got to, because otherwise they just key on that one thing you do best, and they take it away from you. So they don’t know what you’re going to do. So, I have to ask someone who excels at the FCS level: what other schools were you looking at? Well, I had full scholarship offers to East Carolina, Kent State, Akron, Buffalo, Richmond, Delaware, William and Mary, Norfolk State, Hampton. I was just – I chose to go to JMU because location-wise, it was perfect. My father was in Maryland; my mother, she was in Virginia. So it was kind of in the middle for both of them. And at the same time, the academics were top of the line, the program was winning. I just felt like I had the opportunity to come in here and play right away. Do you think it’s been more difficult for you to get your name out there as a JMU player? No, not necessarily. I felt like, because I was at a smaller school when I did what I did this year, it stood out that much more. Because if I was at a bigger school like Tech or Wake Forest or somewhere like that, I felt like my numbers would have been just average for everybody else. You started doing really well your sophomore year. At what point did you begin thinking that you could play in the NFL? Well, I actually didn’t start thinking that until about the midway part of this season. You know, when I first got added to the Buck Buchanan list, I’d be like, “Well, maybe I could do it.” And then by the end of the season, I played vs. UMass and had that big game (11 tackles, 2.5 for loss), I was like, yeah, I can play at this level. Talk about your combine performance a little bit. It seemed like it went really well. Did you meet your expectations? Oh, yeah, I definitely did. I definitely met my expectations. I felt that I could have done better on some drills, but just the way it was set up, as far as, you know, you’re there for 40s, you’re running this last day. You’re actually doing position drills before you do your tests and stuff like that. I felt like, even in those circumstances, I felt like I performed at a high level, and I definitely impressed a lot of the coaches. And I’ve been getting positive feedback since then. In terms of meeting with the coaches, what were some of the stranger or unexpected questions that you got? Oh, what did I get? I’m trying to think, because they had some unexpected questions… I got you one: I was with the Redskins, and the guy asked me, if I’m coming into camp, I’m 30 minutes early, I’m sitting in the front row of the meeting room. Brian Orakpo walks in and says, “That’s my chair.” Am I going to get up and give him my spot, or am I going to sit there and fight him for a chair? … You know, I was just like, I’ll slide over, because I mean, he’s the million-dollar man; it’s not that important. So he was like, “Oh, so you’re scared of him?” And I was like, no. And he was like, “So why don’t you go fight him?” There was kind of like no right answer to the question and everything, the way he was asking it. Yeah, I don’t know. I think I’d probably just run out of the room. So, also, in terms of kind of making yourself available, you put up a Facebook page. Is that something that you did for football, or something you already had? I mean, I kind of already had it… I used that, definitely as far as when the agents were getting in contact with me. It was just easier access to me compared to trying to get my number, because I had just changed my number at the time. Going back to high school, you were a wrestler. How much do you think that helped you playing football? Well, I definitely felt that it helped me as far as my leverage went, and learning how to stay low… But in high school, I was a multiple-sport athlete. I did wrestling and basketball during the same season; I did track and soccer during the same season. All of those kind of geared to get me better at football each way, you know. With basketball, it was the conditioning side of it. With wrestling, it was learning leverage. With soccer, it was working on my footwork. It was just another way to get faster. So you played five sports? Yes, sir. I did that my junior and senior year. (Laughs.) So, in track, you threw the shot? Yes, sir, I threw the shot. Yes, sir. So, what’s next? Do you plan to just keep going to meetings? What are the types of things that you’re trying to show NFL teams? Well, as of now, the only thing left on my schedule to do is meet with Philly (Tuesday), and then next week I have San Francisco. Other than that, I’m just going to continue to work out and just relax until the draft comes. And then, whichever scheme I get into, that’s when I’m going to start learning as far as what I need to do at backer. All right. Well Arthur, I wish you a lot of luck. Thanks a lot for talking to us today. I appreciate that. No problem. Ha ha! Yeah Arthur Moats! I’m a JMU alum and a Patriot fan, I’d love to have him on the team. He’s right. He’s got a lot of moves, I loved watching him play. The Buffalo Bills picked Arthur Moats in the sixth round, 178th overall.